LED stand for Light Emitting Diode and as you might guess it is a p-n junction diode which emits light during the recombination of charge carriers in the semiconductor material inside the diode.Â LEDs emit light atÂ different wavelengthsÂ depending on the band gap in the silicon, in this way the LEDs achieve different colours. To control an LED you need to know the forward voltage and the forward current of your LED. Most LEDs are good to 20 mA so a safe number if you don’t know the forward current is around 10-15 mA. If you don’t know the forward voltage then I’d hook up my multimeter to measure current and with no limiting resistor on the LEDÂ ramp the voltage up from 0 volts until you reach 15 mA and make a note of the voltage and use that as the forward voltage. 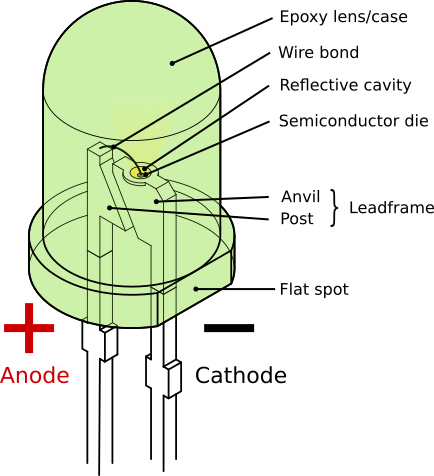 The polarity of the LED is denoted by the length of the LED leg, the long leg is the Anode or the positive connection and the short leg is the cathode or negative connection. It is pretty common to get 470 Ohm resistors with LEDs when you buy them from ebay sellers as that is a high enough resistance to ensure you are below 15 mA at 5 V for most LEDs.